Imagine that, Samsung will soon out a wireless charger that can top off both a phone and a smartwatch! The company stopped just short of Apple lawyers' red line by not throwing an IconX charging into the mix. Apple's AirPower, however, is still its longest-running vaporware, and won't be appearing until the fall, while Samsung's Wireless Charger Duo will be strutting its stuff alongside the Note 9 on August 9. Since the boxing of the Wireless Charger Duo appeared one moon ago, pictures of the actual thing have been unearthed, and the price tag reiterated. 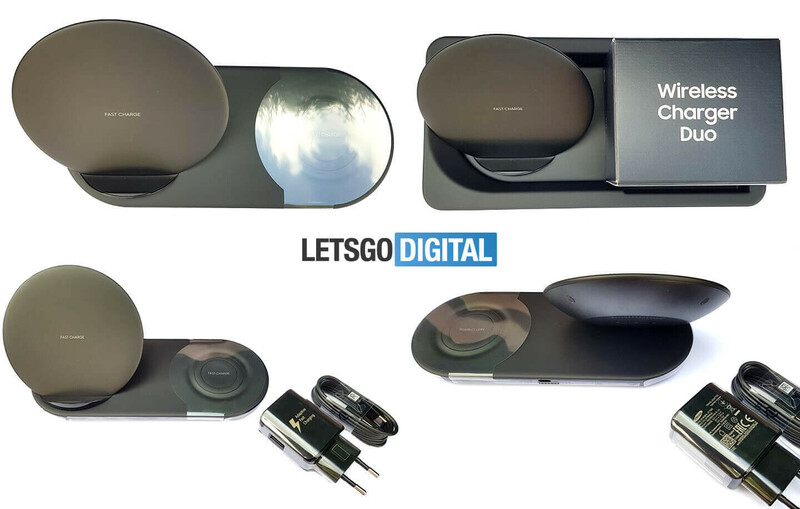 The Duo seems to be a combination of Samsung's wireless chargings pads and stands, as can be expected from the title, allowing you to charge a handset both lying down or standing up, and with an adjacent area for your smartwatch, presumably the upcoming Galaxy Watch, and its Gear predecessors, but essentially any Qi-enabled timepiece, too. The new double-charging piece from Samsung is expected to be unveiled as a Galaxy Note 9 and Galaxy Watch accessory, so mark your calendars on August 9 for this puppy. The report's insider sources claim an EUR 75 pricing, which will likely translate into the same tag, but in dollars, come this side of the pond. Given that the current 2018 edition of Samsung's wireless charging stand has a $70 MSRP, but is more often on sale than not, we'd wager to guess the Duo will find a warm welcome at this price tag. To PA: How is copycat, when Apple product is still not released?? Are you crazy or just blind Apple fans? The same was with P20 Pro review - Apple copy! How? Doeas iPhone X have 3 cameras? Does it have FPS in front? If you do not realize it yet - all phones are rectangular - with more or less curved edges. Eye phone arena strikes again. Samsung Wireless Charger Tray Design. Introduced over a year ago and can charge wireless-ly multiple devices at the same time. Do your homework PA! Wireless charging is just like a drawer in your desk. Putting 2 doesn't make it special. Are we going to make a fuss when there's 3 and then 4 and then 10? Who cares. Soon there will be a pad that you can put as many devices as can fit. Samsung has had many phones and watches that use wireless charging so of course they know they have customers with 6 devices in the family that need to charge, it's no leap to imagine they have always planned to make multi chargers. As an engineer I do not consider it in any way an invention to put two chargers into a package, just like two desk drawers was never a unique thought, it was just the next obvious progression. Soon I hope it's a ultra thin clear mat that you place on any desk or table and it provides power to all the devices and laptops on it. These are still bulky and lame unless you want the stand. They better no allow anyone to patent the mat, that's way too obvious, and if it's not then it's mine as of now, and i just made it public.